Happy hump day, friends! I’m still suffering from whatever sickness took hold of me Sunday and still hasn’t let go, but it’s not the flu so I’m thankful for that. It would be nice to breathe, however. And taste. Yeah. I haven’t been able to taste anything I’ve eaten or drank in the past two days. Awesome, right? Notsomuch. I will say that I am grateful that the sickness didn’t grab hold of me until Sunday, since Saturday was wedding dress shopping day! My parents came into town, and my mom and three of my bridal party went to find my dress. It was crazy busy in the bridal shop, but we found the dress. The first one I tried on, actually. I tried on a few more, but ultimately went back to that first one. And I can not WAIT for J to see me in it on our wedding day! Of course he’s tried to get me to show him the dress or a picture, but no dice love. You must wait! And of course when I made this amazing meatloaf I still had my ability to taste, thankfully. Since we have a good amount of venison hamburger meat in our freezer, I’ve been trying to think of different ways I can fix it. I basically thought of ways that I use other ground meats, and found recipes using venison instead. This meatloaf was one of those recipes. It was awesomesauce. J said it was the best meatloaf EVER. That’s a pretty bold statement from someone who loves meatloaf. So in other words, you need to make this. Like, yesterday. Preheat the oven to 350 F. Spray a 5×9 loaf pan with cooking spray and set aside. In a large bowl,add the egg and whisk lightly. Add the bread crumbs and venison and lightly mix. Add in the mustard, cilantro, garlic powder, onion flakes, thyme, cinnamon and paprika. Mix again by hand until all ingredients are well combined and evenly incorporated. Place the mixture into the prepared loaf pan and lightly pat it down so it’s evenly distributed in the pan. Bake uncovered for 40 minutes or until the internal temperature of the meatloaf registers 160 F on a meat thermometer. While the meat is cooking, combine the remaining ingredients together in a small bowl. Taste and add additional honey or Worcestershire if desired. 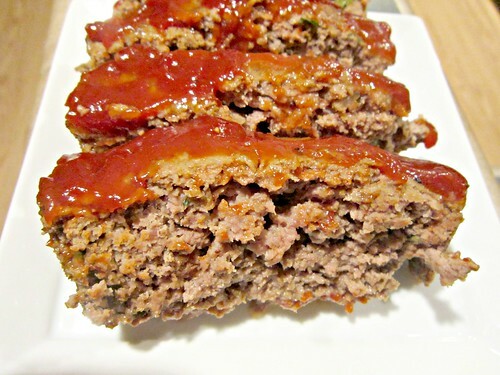 At the end of the 40 minutes, remove the pan from the oven, spoon and spread the ketchup mixture over the top of the meatloaf, and return to the oven for an additional 10 minutes. Allow to sit for about 10 minutes before slicing and serving.